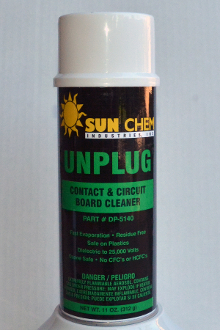 UNPLUG is a highly effective blend of solvents that are fast drying, non-conductive and safe to use on plastics, rubber and metal. Does not contain CFC’s or HCFC’s and is ozone safe. Use to remove dirt, grease, oil, and grime from circuit boards, computers, magnetic tapes, printed circuits, gauges, switches and relays. FOR USE ON: Circuit boards, electrical contacts, electric motors, machinery parts, electronic equipment, molds, textiles and more.